I just wanted to post a quick note reminding all of you to please remember to vote tomorrow, Tuesday, November 8, 2016. If you need help finding your polling location, please visit the Maricopa County Website at: http://recorder.maricopa.gov/pollingplace. This election is critically important, so please encourage your friends and family to vote as well. Additionally, please join me for an Election Night Victory Party at the Garden Court at the Hyatt Regency Phoenix tomorrow night starting at 6:30 pm. 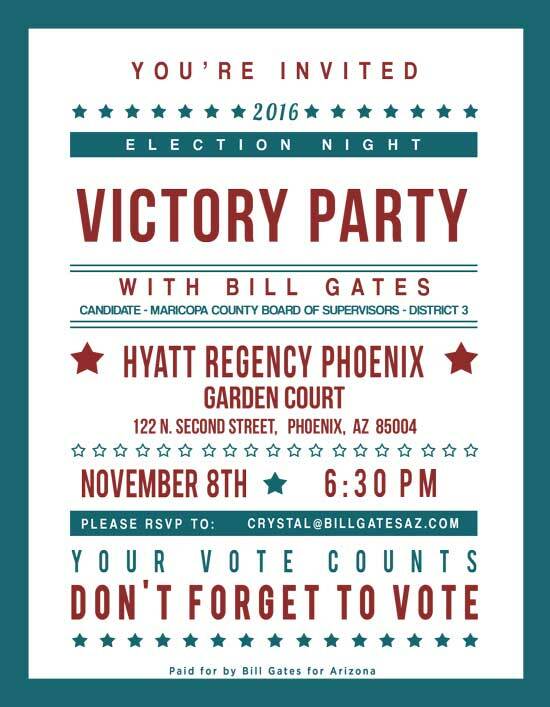 Please RSVP to crystal@billgatesaz.com.